What is a dermal matrix and how is it being used in breast surgery? Allograft is an organ or tissue donated from one individual to another. What is an acellular dermal matrix? It is an allograft made from donated human dermis (skin). An acellular dermal matrix (ADM) is a soft tissue substitute that can replace or support tissues; in plastic surgery they are increasingly being used for breast implant revision and breast reconstruction surgery. Derived from donated human skin, it looks like a thin layer of white leather. 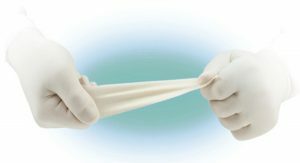 The matrix undergoes a number of processes to remove the epidermis, sterilise the matrix and reduce the likelihood of a rejection response. How does Dr Sharp use ADM? Dr Sharp uses the latest generation of ADM, developed specifically for restorative breast surgery. It provides lower-pole support for women having an implant placed in their breast that may require additional tissue to support the lower portion of the implant - for example, in breast reconstructions or breast implant revision surgery. The mesh is attached to the pectoralis muscle in the chest – increasing the size of the pocket in which the implant is placed - acting as a hammock, cradling the breast implant and helping to create a more natural breast contour. The use of an acellular dermal matrix offers a number of advantages as it provides structural support for the breast, acts as tissue matrix for the body’s own tissue ingrowth, produces consistent results and is available in multiple sizes to meet the needs of each patient’s surgery. How is ADM used in breast implant surgery? ADM can be used as a support ‘sling’ for the breast implant, where natural tissue is lacking or deficient. This is increasingly common among women who have had large breast implants in the past; their internal tissues are unable to cope with the weight and strain of the oversized implants, and in some cases, the implants ‘bottom out’ or form a double bubble deformity. ADM can be used to provide additional breast implant support during revisional surgery, helping to restore the inframamary fold. How is ADM used in breast reconstruction surgery? ADM can be used for patients undergoing breast reconstruction after mastectomy, acting as a scaffold to create a more natural looking breast. The matrix allows the placement of a breast implant immediately after a mastectomy is completed, and is suitable for women who have different types of mastectomies. The technique facilitates additional implant coverage and support while enabling larger implants to be placed. Advanced processing and testing ensure that patients receive healthy tissue that has been produced to the highest standards, and supplied with the same sterility assurance as injectable medications. ADM’s are increasingly used by surgeons internationally to provide implant or tissue expander coverage. A survey of surgeons in the US showed that greater than 50% of American Society of Plastic Surgeons who perform implant based reconstructions use ADM.
What does acellular dermal matrix cost? ADM is now listed on the Medicare Benefits Schedule, meaning that where its use is deemed medically required, it is accompanied by an item number and rebate. If you have private health insurance and ADM is required to complete your breast reconstruction or implant revision procedure, your health fund may cover its cost.